Several people wrote to me and asked for a fish sandwich during these vacation-memory themed segments. One lady in particular told me that she sat on a beach-front patio in Florida and had fried fish sliders. All she remembered was that there was a light batter, but a very spicy cream sauce. This is what I came up with, very easy and delicious and I hope you will all enjoy, as well! This beer batter is the perfect batter for fish sandwiches, tacos and I even used it to make fried pickles! Add vegetable oil to a cast iron skillet or a large skillet. Heat over medium heat. Place 1 cup of flour into one pie plate and set aside. Place 1 cup of flour into second pie plate and add seasonings. Stir to combine seasonings. Slowly pour the beer into the seasoned flour mixture, whisking to combine. You do not want the batter too thick, because it will be "gloopy" and you cannot work with it, but too thin, and you will not be able to work with it. First, place fish chunks into the plain flour dish, and lightly coat. Shake off any excess flour. Next, dredge the fish in the beer batter. Third, gently place the fish into the hot oil. (To check and see if your oil is hot enough if you do not have a thermometer, gently drop a pinch of flour into the oil. If it sizzles, you know your oil is ready). The fish will not take long to cook; about 3 minutes per side. Turn once and cook until golden brown. Remove and place on a paper towel-lined plate, then immediately squeeze fresh lemon juice on the fish. Place spicy hot cream sauce, then lettuce, tomato and red onion and pickles on buns. Add fish then enjoy! Stir all ingredients together. 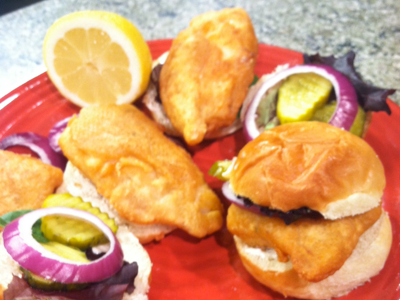 Spread on beer battered fish sandwich and store leftovers in an air-tight container in refrigerator.